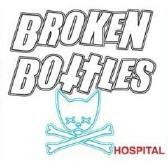 Apparently this band puts their eyeliner on with the conviction that they play their punk rock with, as "Hospital," the latest disc from Broken Bottles denotes. Getting the punk rock sneering vocal down to a science and aping more than its share from early Social Distortion, this Orange County, CA ensemble produce fourteen cuts of basic, yet all-encompassing, punk rock whose simple three-chord-and-the-truth authenticity is branded on tracks like the stock skate anthem "Skateboarder" and "Teenage Dinosaur," carrying an appeal that should appease anyone considering themselves on the outside of the circle. For more information, check out http://www.brokenbottles.net or http://www.myspace.com/brokenbottlesoc.